The auction catalog lists this car as a Courier Stoddard, but according to other sources, the cars were only called Courier – even though Courier was a subsidiary of Stoddard-Dayton (perhaps the “Stoddard is the model name, but it’s rather confusing so I omitted it from the title above). 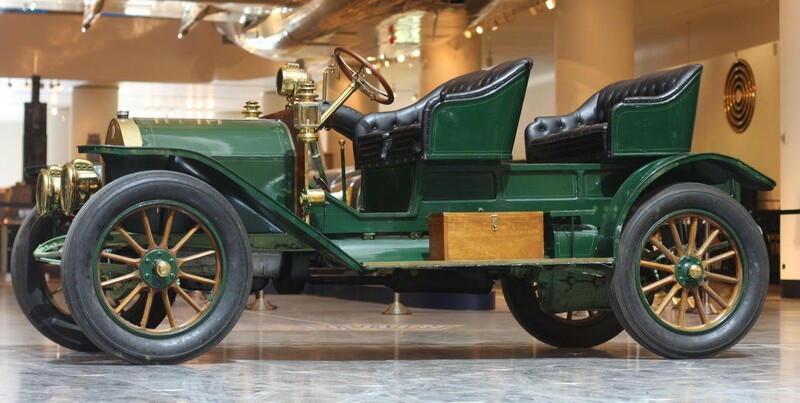 Courier was introduced in 1909 and lasted through 1912 (for the final year they were known as Courier-Clermont once they had been acquired by the U.S. Motor Company – which promptly failed). This was a lower-priced car than the Stoddard-Dayton. They were targeted at Ford buyers who wanted more performance for a similar price. Performance was likely: this car is powered by a 22 horsepower 3.7-liter straight-four. They were also durable as Courier built their cars like a light truck but with roadster bodywork. This particular car spent a long time in Chicago’s Museum of Science and Industry. The workers there did a light restoration on it years ago, although the car was mostly original when it was performed. Everything is either correct or period-correct and in working order and it has been in a private collection since 2008. Courier was a very short-lived automobile, making this very rare. It should sell for between $30,000-$40,000. Click here for more info and here for more from Bonhams’ awesome Preserving the Automobile sale. This entry was posted in Uncategorized and tagged 20, auctions, Bonhams, cars, classic cars, commercial, courier, stoddard, wagon by classiccarweekly. Bookmark the permalink.